The energy consumption of cities will certainly decline in the coming decades, but cities may not disintegrate as many expect. Among those who understand Peak Oil and the fragility of global supply chains, it is widely assumed cities will quickly become hellholes of squalor and extreme violence once liquid fuels are no longer cheap and abundant. Perhaps, but history suggests cities are highly resilient adaptations. What never ceases to amaze me is how few people who expect cities to implode have any grasp of the size and scale of cities which thrived for hundreds of years without any fossil fuels. Fernand Braudel's masterful three-volume history of European Capitalism (Civilization & Capitalism, 15th to 18th Century) The Structures of Everyday Life (Volume 1),The Structures of Everyday Life (Volume 1), The Wheels of Commerce (Volume 2) and The Perspective of the World (Volume 3) is in effect a history of trade and the rise of urban centers. Paris and other cities were already huge, complex centers of commerce and wealth in the early 16th century. In Asia, the Chinese T'ang Dynasy capital of Ch'ang-an (A.D. 618-907) contained hundreds of thousands of residents, and drew in the wealth of all Asia: The Golden Peaches of Samarkand: A Study of T'ang Exotics. Even today, you need to rent a bicycle to tour the vast ruins of the old Thai capital of Ayuttaya, which had a population in the hundreds of thousands in the 15th century. If cities are so fragile, how did they grow to vast size without any high-density fuel other than wood, and no transport other than animals and human energy? Yes, these were not "modern" cities in terms of energy consumption, but it terms of exotic goods available, plentiful food, high culture and intrigue, they were thoroughly modern. Rather than attempt an over-arching synthesis of the vast literature on urbanism, I will make a few points which I think are suggestive of the enduring value of cities, and of the ways in which wastrel (and thus unsustainable) cities might lower their energy consumption and increase their sustainability. 1. 68% of all trips within Tokyo are by foot, bicycle or subway/transit. 95% of the trips in Houston are by private vehicle. Houston is not Tokyo, but this is a way of suggesting that when liquid fuels become costly/scarce, not all cities are equally vulnerable to implosion. One can rather easily walk across central Paris (about 7 miles/10 kilometers). I did so in 2004 and called it "Paris Transect." On a bicycle and on flat terrain, 10 kilometers is a modest distance. 2. Over 100 million recent arrivals in Chinese cities are domestic immigrants from the countryside. Should the urban zones become unliveable, or if jobs dry up, they will return to their home villages. They have that option, as do millions of recent residents in Mexico City and other mega-metropolises. Many cities have a large transient population who have an "opt out" alternative to fighting it out for the dwindling resources of the city. 3. Cities have thrived for thousands of years because they provide an opportunity to arbitrage the value of goods and labor brought in from the countryside. The value of labor in rural areas tends to be low, and opportunities to earn cash tend to be limited. The opportunities to sell one's labor are more plentiful in cities, and so the easiest way to increase the value of one's labor is to move to a city. The value of goods in their region of origin tends to be low. Almost by definition, there is a surplus of local goods and thus a low price for the surplus. By moving the surplus to a city, where demand tends to be higher, then the value of the goods can be arbitraged to the benefit of the transporter/merchant. In this way, cities are natural magnets for skilled labor which is often undervalued in rural/village settings and for goods which are in surplus in the countryside but in demand in cities, where they will attract a much higher price. All this is laid out in fascinating detail in Braudel's books. 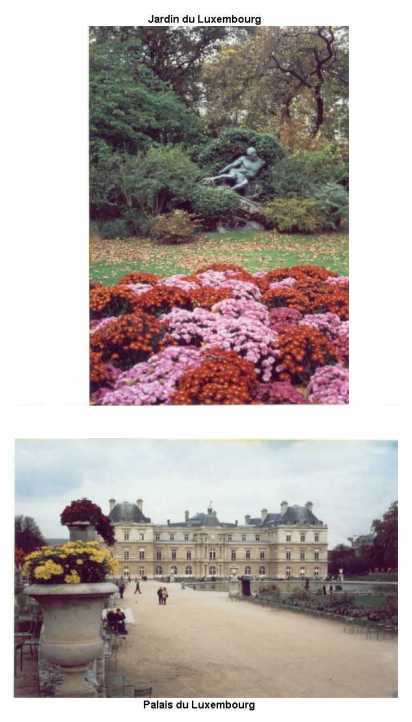 Thousands of people earned a living carting kindling and wood to Paris, and thousands of others earned a living removing the human waste from Paris to the countryside for use as fertilizer. 4. Cities had huge capacities for producing food and meat within their own boundaries. 5. Marriage and mating opportunities are more abundant in the city, and this also makes cities magnets for young workers. 6. As Braudel notes, everything costs more in cities, but then wages are higher. 7. Cities attract talents which are generally not valued in small-scale settings. Here is a chart of cities, arranged by the density of college graduates per square mile. Very densely populated cities such as San Francisco and New York obviously have more college graduates per square mile because they also have more residents per square mile. 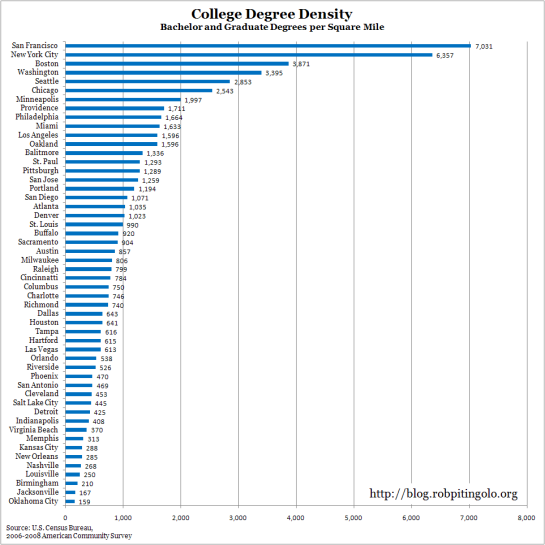 San Jose (Silicon Valley) very likely has as many college graduates per capita as San Francisco, but it is 16th on this list. Despite this somewhat misleading metric, the chart shows two things: A. College graduates tend to be attracted to large cities with many other highly educated people, and B. "Sprawl" cities with low population densities per square mile will have fewer college graduates per square mile. This in itself has little meaning, but it does suggest that it is more time-consuming and troublesome for people to get together in low-density cities. These barriers to meeting others of like mind may make cities more or less attractive to those seeking such connections. Will cities consume less resources in the decades ahead? Yes. Did great cities prosper on much lower energy densities in the past? Yes. Will the financial and social benefits of cities vanish simply because cheap energy is no longer abundant? No. Will some cities wither or lose population? Undoubtedly. Will low-density cities move to higher densities? Probably. Will mega-cities become unviable? Possibly. Cities are in some important ways akin to organisms; they will adapt to the flux of energy and commerce. Thank you, Bonnie C. ($30), for your extremely generous donation to the site -- I am greatly honored by your support and readership. Thank you, John E. ($10), for your much-appreciated contribution to the site -- I am greatly honored by your support and readership.